In the history of the NBA there hasn't been a single individual that won the NBA championship all by himself. Wilt Chamberlain needed Jerry West and Gail Goodrich. Magic Johnson had Kareem Abdul-Jabbar, James Worthy and Byron Scott. Larry Bird had Robert Parish, Kevin McHale and Dennis Johnson. The same is true with Michael Jordan. It took seven seasons before Michael tasted his first championship as Jordan did not have the necessary supporting cast to ascend to the top of the NBA throne. It was not until Scottie Pippen and Horace Grant emerged that Michael was finally able to capture the elusive championship crown. This shows the value of teammates in one's success. 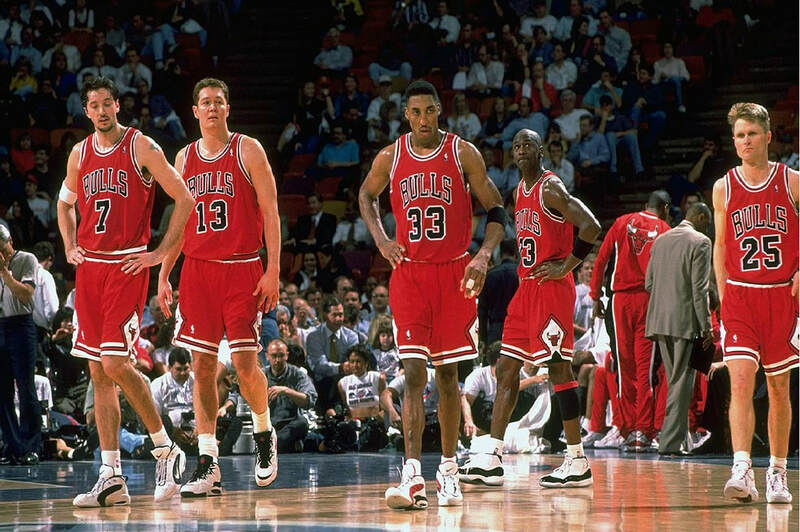 Here are five of the most famous of Michael Jordan's teammates. Scottie Pippen was the Robin to Michael Jordan's Batman. The fortunate thing though is that Scottie never sought to supersede Michael. A lot of tandems in the NBA never worked out because both wanted to be the alpha dog. Shaq and Kobe failed because Kobe always thought he was better than Shaq. Durant and Westbrook fell apart because Russ felt he was the superstar. Scottie has a 7'3" wingspan which is the same as Kawhi Leonard. The two have very similar games as both are lock down defenders who usually guard the best player of the opposing team on a nightly basis. Both players use their enormous wingspan to disrupt opposing teams' offenses. They also use it for the occasional steal and block. It was a nightmare for opposing teams to get the ball across the halfcourt with the Bull's lengthy trio of Scottie Pippen, Michael Jordan and Ron Harper. With each sporting an above average wingspan, passes by opposing teams were easily deflected and it was hard to simply get the ball across. Pippen was a true two-way player. He was not only an efficient offensive player but a tremendous defensive player as well. Scottie Pippen was tasked to guard the best forwards and guards on a nightly basis. He was quick enough to defend speedy guards and was big enough to match up against opposing forwards. One of Scottie's finest defensive moments was when he was tasked to slow down Magic Johnson in the 1991 NBA Finals. By that time, Magic already had 5 championships. He was the engine that ran the Showtime Lakers and he was a matchup nightmare. He was a point guard in a power forward's body. He also had a tremendous supporting cast in James Worthy, Mychal Thompson, Byron Scott, Sam Perkins, A.C. Green, Vlade Divac and Elden Campbell. The Showtime Lakers were the most dominant team of the 80's with 5 championships. After successfully defeating "the old guard" Los Angeles Lakers the young Bulls would win two more championships and would successfully complete a three-peat. Their second championship was won against Clyde Drexler and the Portland Trailblazers. The third championship was won against Charles Barkley and the Phoenix Suns. It was thought that Scottie was a mere beneficiary of Michael's greatness. Pippen however proved the detractors wrong when he averaged 22 PPG, 8.7 RPG, 5.6 APG and 2.9 SPG and .8 BPG. The Bulls were not the same without Jordan and were eliminated by the New York Knicks in seven games. They still won 55 games that season though and were better than expected. The next year, Michael Jordan rejoined the team at the tailend of the season. The Bulls made a late surge with Jordan back in the fold but ultimately fell to the upstart Orlando Magic in the Eastern Conference Semifinals in 6 games. The next season was redemption time for the Bulls and they completed the first 70-win season in NBA history with a 72-10 record. It stood unchallenged for two decades before it was surpassed by the 73-9 Golden State Warriors of the 2015-16 NBA Season. Alas, no dynasty is forever and upon the breaup of the 1998 Bulls team, Pippen was shipped to the Houston Rockets. A trio of Hakeem Olajuwon, Charles Barkley and Scottie Pippen is an awesome front court. However, they were all past their prime. Furthermore, Pippen and Barkley did not get along at all so after a year rental, Scottie was shipped to the Portland Trailblazers. The Chicago Bulls retired Pippen's jersey on December 9, 2005. He joins Jordan's 23, Bob Love's 10, and Jerry Sloan's 4 as the only numbers retired by the Bulls organization. He helped bring six championships to the organization and is serving as one of the Special Advisors to the President & COO along with Toni Kukoc and Horace Grant. Scottie Pippen is a basketball analyst for ESPN and is frequently a guest analyst for The Jump with Rachel Nichols. Rachel was a journalism student in Northwestern and was doing work for the Washington Post at the time. She claims that Pippen was always very gracious and professional in dealing with her eventhough she was just a college student at that time. This was in stark contrast to how many athletes mistreat the people in the media.